Are you joining us at Wanderlust in September? 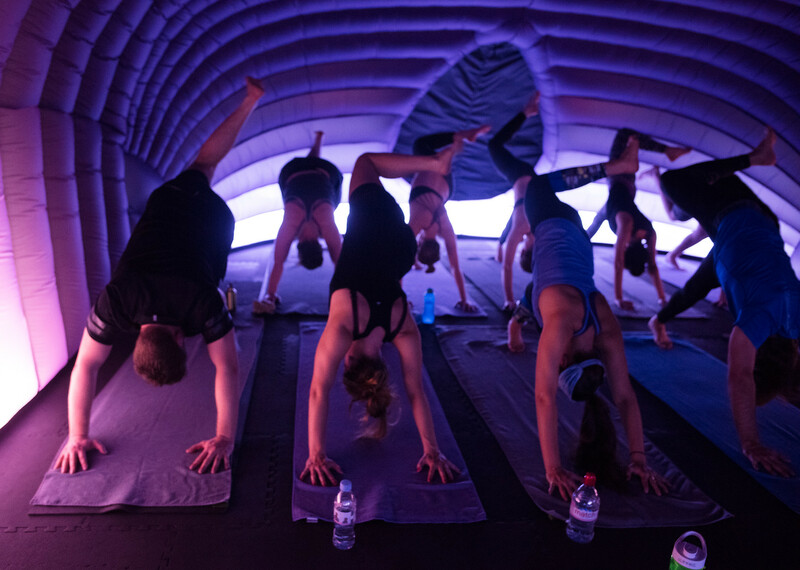 As soon as one Wellness festival ends we start thinking about where to get our next fix of yoga, mindfulness, great food and even better company – thats why this September we’re off to London for the Wanderlust festival! Will you be joining us? We’ll be over there covering the festival and bringing you first-hand insights, backstage gossip and competitions galore. Find out what to expect …. Wanderlust, producers of the largest yoga lifestyle events in the world, will bring Wanderlust 108, the world’s only “mindful triathlon,” to Victoria Park, London, UK on Saturday September 23, 2017. 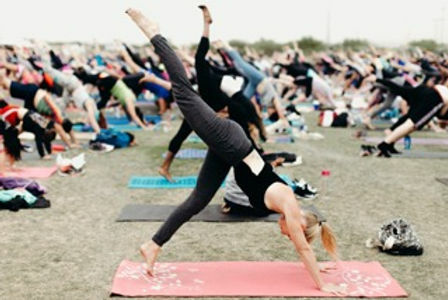 Wanderlust’s signature triathlon, which is produced in partnership with adidas, attracts thousands for a five-kilometer run (or walk), an outdoor 90-minute yoga class, and a guided meditation. Mindful triathletes will also enjoy live music and DJs, artisanal vendors, local foods and further activities to be revealed. Participants can add a free scheduled class such as aerial yoga, acro-yoga, hooping, walking meditation, workshops, or a community yoga experience from favourite local teachers. Celest Pereira (triyoga) and Michael James Wong (Boys of Yoga / Just Breathe London / Sunday School Yoga) are among the inspiring yogis leading the classes with more names to be announced. 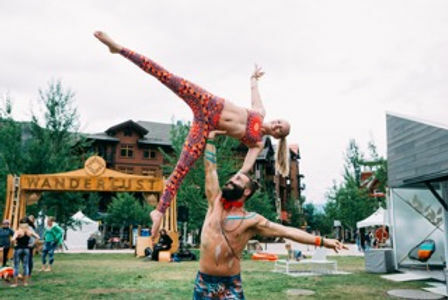 Wanderlust US regulars will be flying in for the day, including DJ Taz and Arli Liberman, who live soundtrack the yoga and meditation practice. As with all Wanderlust 108 events, the Kula Marketplace will showcase local craft vendors, including clothing, jewellery, and handcrafted items. Local and organic food vendors will be on site, as well as the “adidas x Wanderlust Dome”, showcasing the latest collection between Wanderlust and adidas. In 2017, Wanderlust events will take place in over 60 cities in more than 17 countries on 5 continents. Wanderlust’s mission is to help you “find your true north” — to cultivate your best self — and Wanderlust 108 was created to support that mission on a large scale. 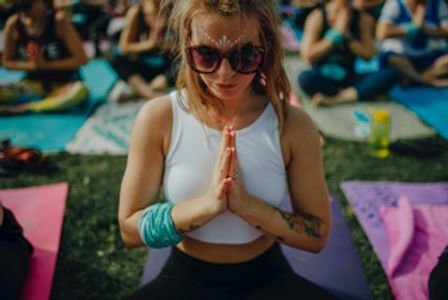 Wanderlust 108 will foster individual wellness and positive social change by building a community around mindfulness practice such as yoga and meditation. Mindfulness practice has been proven to have many benefits, including anxiety reduction and improved cognition. Wanderlust 108 will donate £1 from every ticket sold to the Hope For Children charity (https://hope-for-children.org). Have you seen the jaw-dropping line-up for Thrive Wellness Festival this weekend? Its your chance for an exclusive audience with well-known names like The Happy Pear, Derval O’Rourke, Platinum Pilates and more. All classes are completely free and are including in the entry fee. We’ve picked some of our favourite below and included a copy of the full line-up so you can start planning your THRIVE days! 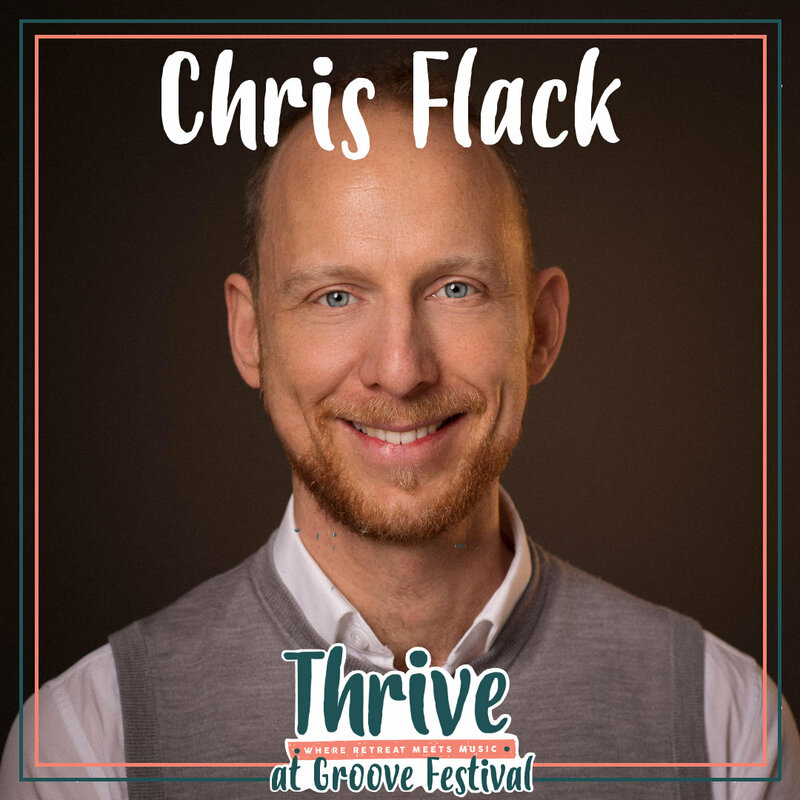 Chris Flack will be on stage at 2.30pm on Saturday talking all things ‘Switching off and Recharging’, and again on Sunday at 1pm. I first met this weeks Wellness Guru, Julie Burke, when i asked her to teach a Yoga class at one of our regular Wellness Wednesday events. I had long been a fan of her social media presence (@Juliebyoga) – as a fellow Yoga Teacher i can appreciate when a teacher has dedicated themselves to their practice and really mastered their asana skills. Well she was just as warm and engaging as i expected, and all of our guests that night left the Yoga class all aglow and feeling super ‘zen’ post-class. Julie’s career has gone from strength to strength since, and she’s about to embark on an entrepreneurial adventure of her own next month by launching HotPodYoga in Dublin. This weekend she’s teaching at our Thrive wellness event, so we asked her to share her tips for wellness ahead of her class! 1. Tell us about yourself, and how you got to be where you are today? I am a yoga teacher from Dublin, founder of Juliebyoga and Hotpod Yoga Dublin. I left the crazy corporate world to become a full time teacher whilst living in London about 5years ago- before that I was teaching around my full time job. I moved to London in 2011 and worked as a Marketing Manager for a year before making the leap to full time teaching. I reluctantly stepped onto a yoga mat for the first time 10 years ago. I was dragged along to my first class by a friend in work. At the time I didn’t really know much about yoga. From what I did know I had a feeling it wouldn’t be for me. I don’t often admit it but this is one time I am very happy to say- I was very wrong. I had this pre-conceived idea that yoga was just gentle breathing and easy stretching. I have always been into fitness and it has always been a way for me to de-stress and unwind and I really didn’t think yoga was something that would challenge me in any way physically or mentally. Ten years on yoga is not just my job and passion but part of my life in every way. I returned to Dublin in 2016 and since then have been working full time teaching. I started with my own business Juliebyoga and most recently have started a new business called Hotpod Yoga – it is a brand new concept in yoga and i’m very excited to share this with Dublin very soon. It is an inflatable hot yoga studio, which holds 20 people. Designed to take the fear / stigma out of yoga. It is a fun and friendly environment, which welcomes all, levels and offers a unique immersive yoga experience. We are launching in September. I’m usually up about 6am – I’ll either have early morning classes to teach or else I go to a yoga or pilates class. Most of my classes are around the citycentre so I have lots of options close by. After teaching / working out I go to the Fat Fox for my daily treat of porridge. I would honestly be lost without porridge. It is perfect for me as i’m running between classes and often have very little time to eat. The Fat Fox’s porridge is so yummy- it’s dairy free and I usually have it with compote, fresh fruit and a little granola. I’ll usually have mid morning or lunchtime classes to teach- in between or after I catch up on emails and any admin I need to do. If I’m not working in the evening I’ll often go to a yoga, pilates or barre class. My porridge really sets me up for the day so I usually have a light lunch maybe a salad or grab a dairy free smoothie. When I get home in the evening I may have some emails to catch up on or client plans to write for my 1-1 clients and dinner can be anything from chicken with roast vegetables and sweet potato, a stirfry with brown rice or if I need something really quick an omelette. I try to be in bed by 11pm. My students inspire me every day. I constantly say this in classes or through my social media that I truly feel incredibly lucky to be able to do what I do every day. I continually get inspiration from students in my classes. I love it when students come to speak to me before or after class and talk about not only certain poses but how yoga has helped them off the mat or how something we did in class or something I said resonated or made a difference. This inspires me every day to keep doing what I do and love. 4. What’s your goal in life? To be happy – as cliché as it sounds. I feel very lucky to have found something that I love and am so passionate about and to be able to do it as my ‘job’ although I really don’t ever feel like I’m working. I have an amazing partner who makes me happier than I could have ever imagined and we have just bought our first home and starting a very exciting chapter. Both combined make me truly happy- my goal is to keep this as the journey continues. 5. What does Wellness mean to you? To me Wellness is a balance of mental, emotional and physical content. It’s a lifestyle. For me it’s not just my job it’s how I choose to live. It’s about looking after yourself on every level- what you eat, how you exercise, how you treat yourself and others. 6. What advice would you give to a person looking to change their lifestyle to a happier healthier one? Do it- every journey starts with a single step. Every step is a step in the right direction. The only thing stopping you is you. 7. Tell us about your business? 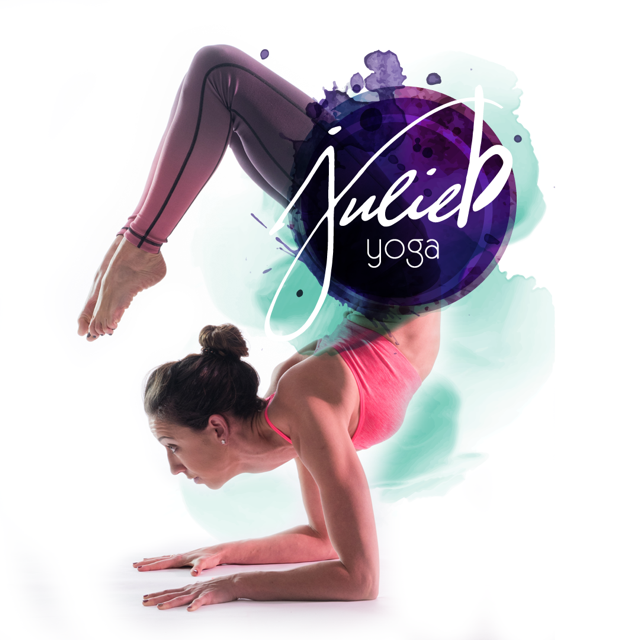 Juliebyoga is all about learning how your body should feel in every pose. In my classes I encourage students to find their edge and learn how to challenge themselves in the right way for their body. When I returned to Dublin after 5 years in London I was disappointed to see so many studios with really busy classes and students not knowing the postures or understanding how their body should feel in the pose. It was more about rushing through a sequence. When I teach it’s really important that everyone feels welcome, safe and understands how to develop their practice safely. Whilst I was in London I worked with a number of professional athletes- rugby teams, weight lifters, runners and boxers. I specialised in sports yoga and spent a lot of time in the UK working with S&C coaches and physios helping build yoga into the weekly training schedule for all levels of athlete. I have a keen interest in developing this in Dublin. 8. Tell us your Top 3 Tips for Wellness? Find balance- wellness is not just about exercising, take time for your mind. Make sure you find time for you in your life. As simple and obvious as it sounds- it’s often something we neglect. Do what makes you happy, be with those who make you happy and let go of anyone or anything that brings negativity to your life. Keep in fun- make sure however you choose to exercise is something you enjoy not a chore. For me it’s yoga or pilates or barre and sometimes a nice long walk or run. Other sports / activities don’t appeal to me- I’m not a cycling fan so I don’t do it. Make it easy- you have to fit your life into it. Don’t make excuses but make choices that allow you to stay fit and healthy without too much effort. 9. So what’s next in your career/life? Launching Hotpod Yoga Dublin in September and renovating my new home with my partner. 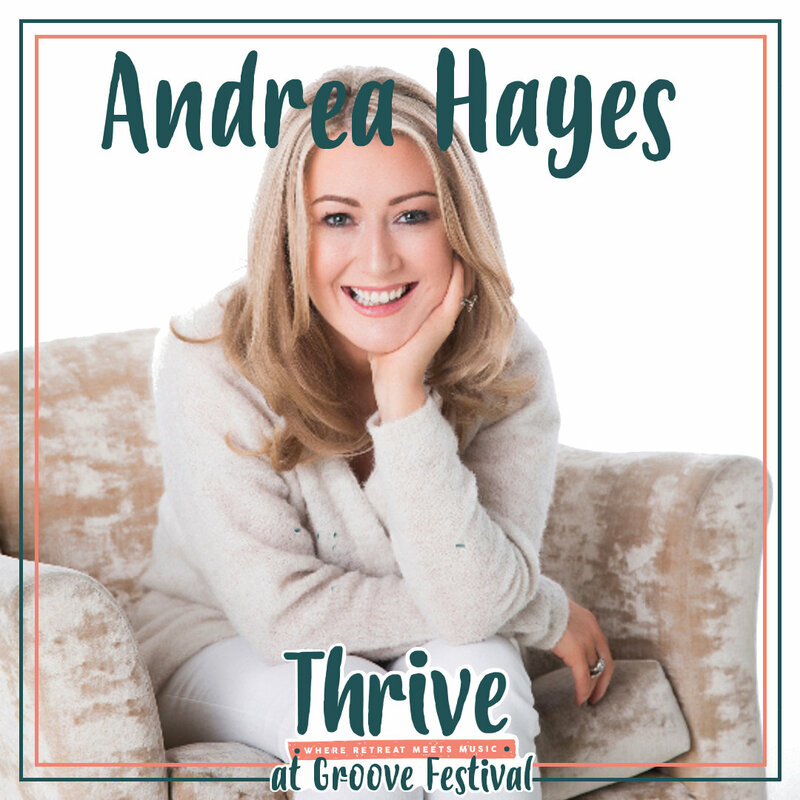 Thrive, Groove Festival’s all new health, fitness and wellness precinct, offers festival goers the chance to relax, rejuvenate and reenergise the mind, body and soul through our weekend program of over 35 free movement classes, wellness workshops and inspirational talks. Featuring over 20 leading names from the world of health, fitness and wellness, including Julie B Yoga, Jenny McElvaney, Wind of Change Wellness, Derval O’Rourke, Roz Purcell and Andrea Hayes, the broad program promises to challenge, excite and inspire. 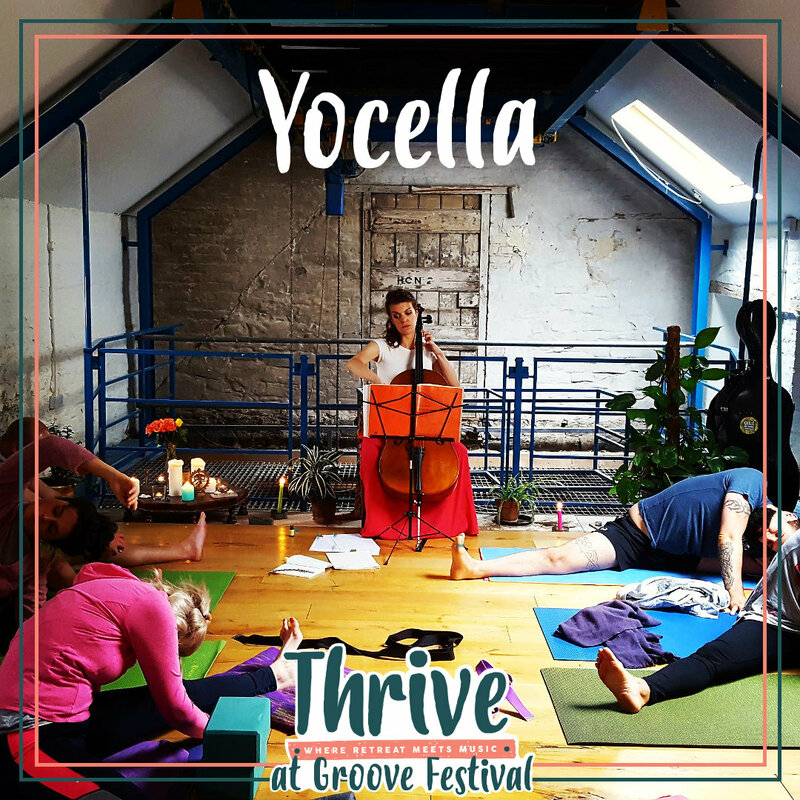 Set in a secluded woodland sanctuary within Killruddery’s gardens, Groove Festival goers can find their flow in a gentle yoga class, let their hair down in a vibrant dance class, or take a seat at the Thrive Talks Stage to discover the secrets to nourishing the body and mind inside and out. 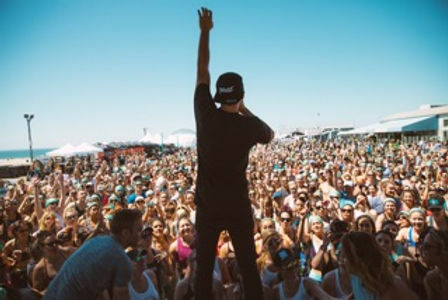 Then it’s time to dance the night away to Groove Festival’s stellar line up of top international and local music acts, tuck into wholesome festival fayre, and discover all that the new and improved festival has to offer. If you’re excited by health, fitness and wellness Thrive is the place for you. 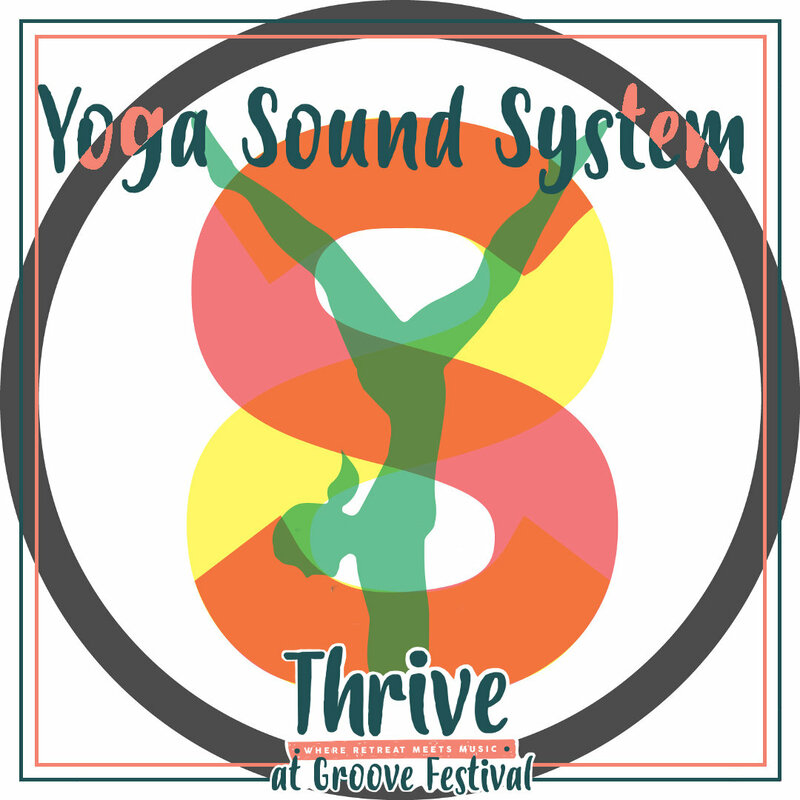 Activity in the Thrive precinct will run from 11am to 7pm over the two days of Groove Festival this August 19 & 20. We’re really lucky at Wellclik.com HQ to get to meet some of the most inspiring therapists and wellness practitioners in the world on a regular basis. People who are dedicating their lives to helping their clients live happier, healthier lives, designing new methods of treatment, nurturing the tried and tested methods of the past that are proven to work and ultimately educating us all to how these methods can be woven into everyday life. 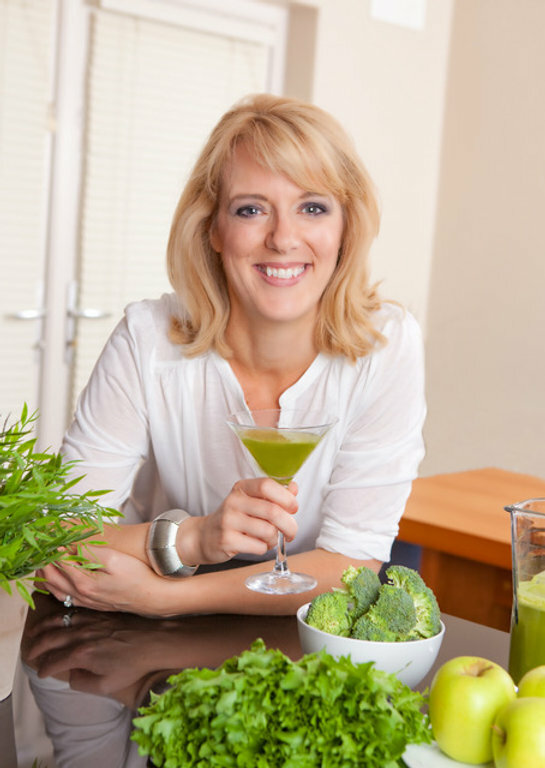 One such person is our own Jenny McElvaney, a nutritional therapist from Dublin, Ireland, who specialises in working with cancer survivors. As a cancer survivor herself, she knows first-hand the journey her clients are on and has a wealth of knowledge on the subject. 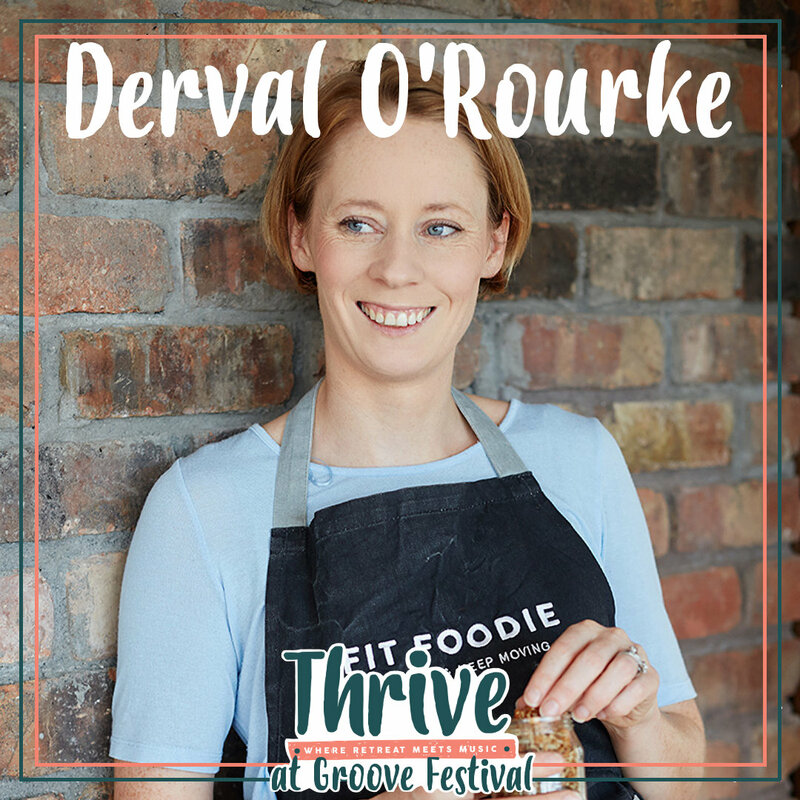 I sat down with Jenny to ask her to share this knowledge with you all today ahead of her appearance at Thrive wellness festival this weekend in Kilruddery House. As a result of being diagnosed with an aggressive form of breast cancer in 2009, I started my training as a Nutritional Therapist and then a Herbalist, and have furthered my training to Acupuncture and Chinese Medicine and developed my business, JM Complementary Therapies. I now specialise in working with those going through their own cancer journey. I have found that those having conventional treatment need support around what they can do for themselves. Complementary Therapies can offer self-empowerment and gives them a sense of control, in order to take better care of themselves. 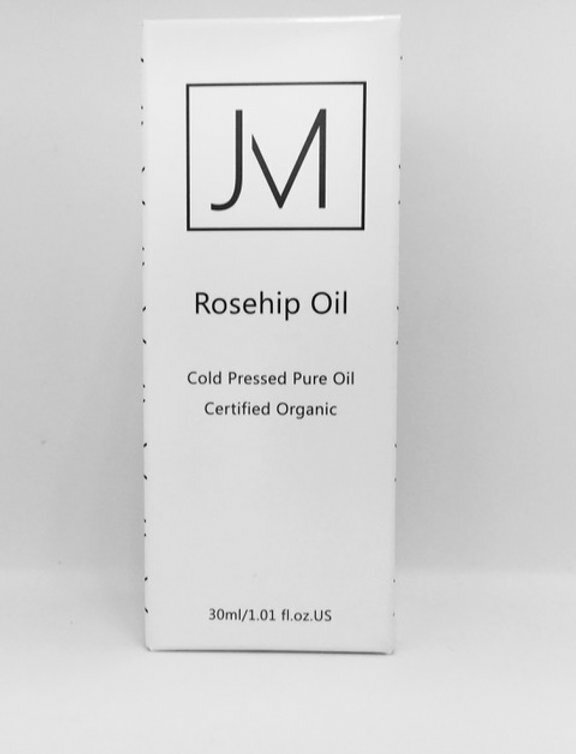 As a result of my training with botanical medicine, I have developed JM Skincare, and my first product will be available to purchase from my website in the coming weeks. It is a natural, organic, facial serum, which offers women the reassurance of using toxin-free and cruelty-free skincare. I like to start my morning by reading up on research or studying, before going to the gym. After the gym, I have my first meal, and my workday begins. I see clients at various times throughout the day. I generally deal with my email and phone calls later in the day, so they aren’t pulling me away from other tasks. Outside of work, I spend time with my husband, family and friends. I also love reading books and spending time experimenting with new skincare recipes. I’m inspired by the many people I work with who have been diagnosed with cancer and have made the decision to turn their diet and lifestyle around. It takes courage and self-awareness to be able to take this first step, and I find working with them to be inspiring and extremely rewarding. My goal is to offer nutritional consultations, herbs, acupuncture and natural skincare, to make people’s lives easier and healthier. There are many therapies that can be used in conjunction with conventional treatment, such as pain management therapies, the use of immune modulating herbs and dietary interventions. Many people are unaware of the vast range of complementary therapies and natural skincare options available to them, and my goal is to bring this information to them. Wellness to me, means looking at every aspect of your life and working on each one. It’s not just about diet and exercise, but other aspects play equally significant roles, such as environmental and emotional state. In today’s world, it’s easy to get sucked in to a time-poor way of living, and it takes a conscious effort to step away from this and slow your life down, in order to take care of yourself. I was once told, “nobody will care about your health like you do”, and it’s so true. We must make ourselves a priority or it will have a knock-on effect on everyone and everything around us. To me, without wellness, we literally have nothing. Don’t take your health for granted. Look after yourself now in order to stay well in 10, 20 and even 30 years from now. Begin to form a habit with one aspect of your life. If you fall off the wagon, don’t give up. Pick yourself back up and start again. Lastly, get support if possible. Having a partner, friend or coach can help keep you on track, especially in the beginning. I offer complementary therapies as well as natural skincare products. The aim of JM Complementary Therapies at jennymcelvaney.com, is to provide the consumer with therapies and skincare products that will enhance their wellbeing, and that will offer them reassurance that they are doing everything they can to help themselves. I see clients on a one-to-one basis, either face to face or on Skype, and also do group talks. I’m also busy behind the scenes creating more natural skincare products. 1. Take care of your body, and it will take care of you. 3. Believe in your own ability to change your world. I plan to continue to grow JM Skincare Products, finish my Acupuncture and TCM studies, and to have as much fun as possible doing both. Featuring over 20 leading names from the world of health, fitness and wellness, including Jenny McElvaney (above), Derval O’Rourke, Roz Purcell and Andrea Hayes, the broad program promises to challenge, excite and inspire. If you’re excited by health, fitness and wellness Thrive is the place for you. 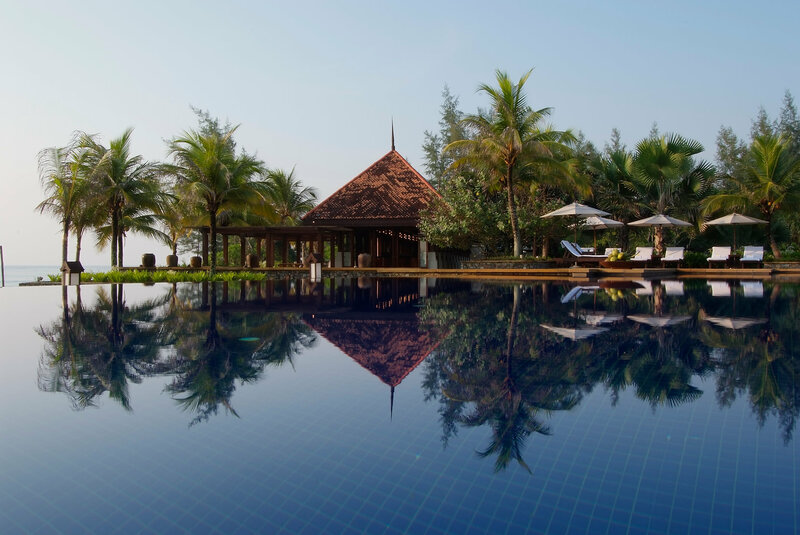 From the 27th of October to the 29th Tanjong Jara Resort will be hosting a yoga retreat in association with Lululemon Athletica, with the resort being Lululemon’s first ever ambassador in Malaysia. The Sucimurni Retreat will be held by Malaysia’s most renowned yoga teacher and founder of Upward Yoga Studio, Ninie Ahmad. This retreat is a unique wellness experience which aims to take participants away from the pressures of daily life. Jessica Yong, Marketing and Communications Director of YTL Hotels, says that “forming the basis of the retreat is the concept of Sucimurni, which places emphasis on the purity of mind and spirit to heal the body”. The relaxation techniques incorporated in yoga very much align with this concept as it teaches students to be more mindful. Through this programme, we not only want to provide guests the chance to recharge but also share skill that they can then integrate into their own lives to ultimately help them heal from within”. Ninie Ahmad says that “one of our guiding philosophies at Lululemon is to empower people and provide the tools and resources to help them live their best lives. That’s why we’re very excited to work with YTL Hotels on this retreat as it perfectly demonstrates those values and reflects what we’re all about as a company. It is my hope that guests will take away valuable lessons from this programme, which will become the building blocks towards a healthier life”. Ninie has trained at the Ashtanga Yoga Centre of Toronto and opened Upward Yoga in 2011. An additional highlight of this retreat is a Zendoodling session. The objective of this practice is to enable practitioners to enter a calm and meditative state by drawing shapes and patterns. It is also known as ‘yoga for the fingers’. Finally, Captain Mokh from the resort will be taking people through their signature Sucimurni exercise, which is a series of stretches inspired by the main animal chakras. 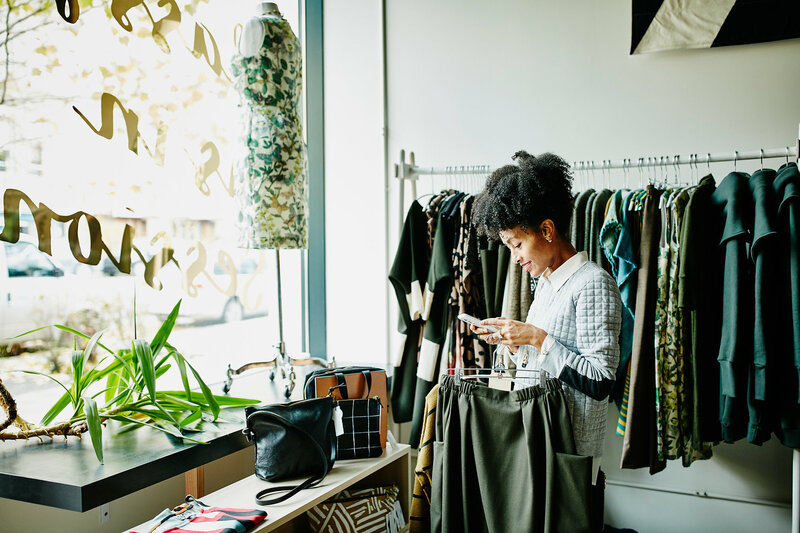 In the last few years fashion brands have mastered the art of managing the supply chain which ensures keeping costs low, in turn, making a larger profit. Production is accelerated to bring new trends to the market as quickly as possible. It allows stores to go from design studio to shop floor in 2 weeks. This comes at a cost. The cheap prices and quick churning over of seasons comes at an expense to the environment, the people making the clothes and the sustainability of the garments. If you want to learn more about behind the scenes of the fast fashion industry, I’d highly recommend watching ‘The True Cost’ documentary on Netflix. After watching it you will want to change your consumer habits and this is where I come in. For about a year I’ve been investigating into how I can change my shopping habits. I made it my mission to find about high quality and ethical brands. Initially I was disheartened, it was harder than I thought it would be to find items that are sustainable are ethically sourced. For a beginner, I’d start simply. 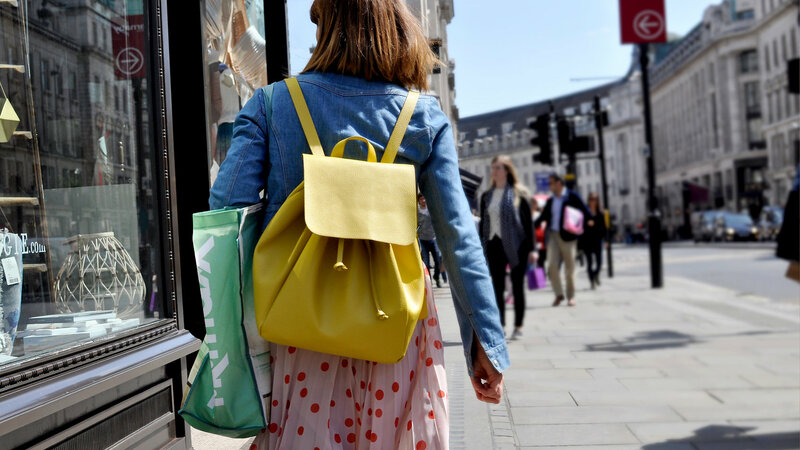 For the most part, ethical brands aren’t readily available in the high street. It takes time and a lot of research to begin the journey into quitting fast fashion. Let me give you some tips on how you can start becoming a more conscious fashionista. 1. Buy from charity shops. If you love shopping it’s going to be hard to change your habits straight away. I don’t want you to give up cold Turkey. Why not try getting your shopping fix from local charity shops instead of the high street for a while? It’s better to use available resources as well as contributing to a charity. 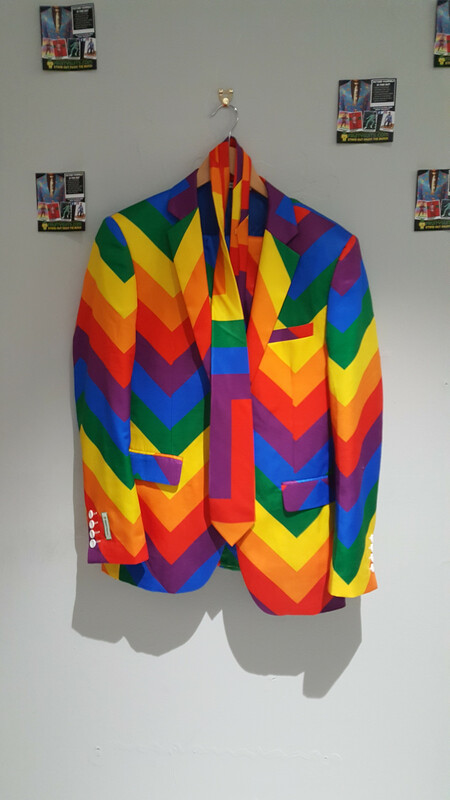 Sometimes you will discover the most beautiful, unique pieces when shopping second hand. Your outfit and style will become one of a kind as you won’t be wearing the same thing as anyone else. One good thing to do is read the tag on the inside of the garment to see the materials used. I’ve bought some of the highest quality items I own from charity shops as it’s easy and cheaper to buy used clothes if you’re on a budget. Sometimes, you’ll even get your hands on a piece that still have their original tags and are practically new. It can be so easy to revert back to buying all the things! Which can make you feel really guilty when you’ve begun your ethical fashion story. A simple tip to avoid falling back into the trap is to unfollow fashion brands on social media. I’d recommend unsubscribing from their mailing list too, as seeing a sale can be very tempting and you can feel like you’ve undone all of your amazing work by giving in. By stopping the temptation, you won’t even know when there’s a sale on which allows you can carry on with your day with money still in your bank account. 3. Start building a capsule wardrobe. By having a capsule wardrobe you can fill your closet with lovely, good quality items and key pieces that suit your body shape and feel amazing on your skin. When you start doing this, you will notice cheap items starting to feel uncomfortable and unpleasant compared to your high quality clothes. Invest in solid staples by doing homework on what you’re missing from your wardrobe. Maybe, you’re missing a pencil skirt that would be very useful to wear for work. By doing your research, you can then go onto buy an skirt that you know will last and feel amazing on you with every wear. You’ll be wearing clothes that you love as opposed to clothes a store wants you to wear. You will look and feel amazing as well. By buying less you are helping reduce your carbon footprint. When you reduce your shopping trips to fast fashion brands you will stop purchasing throw away items that don’t last more than one season and than have to replace. Instead you can use the money you save by buying from a local designer or an ethically sourced brand. These 4 things are the best way to ease yourself into quitting fast fashion. You don’t have to spend a lot of money. In fact you’ll start buying less items, you’ll have a wardrobe that you love and you’ll feel better about your contribution to society. Anantara Maldives is a resort that is aimed at guests who want to incorporate health and wellness as an integral part of their holiday. 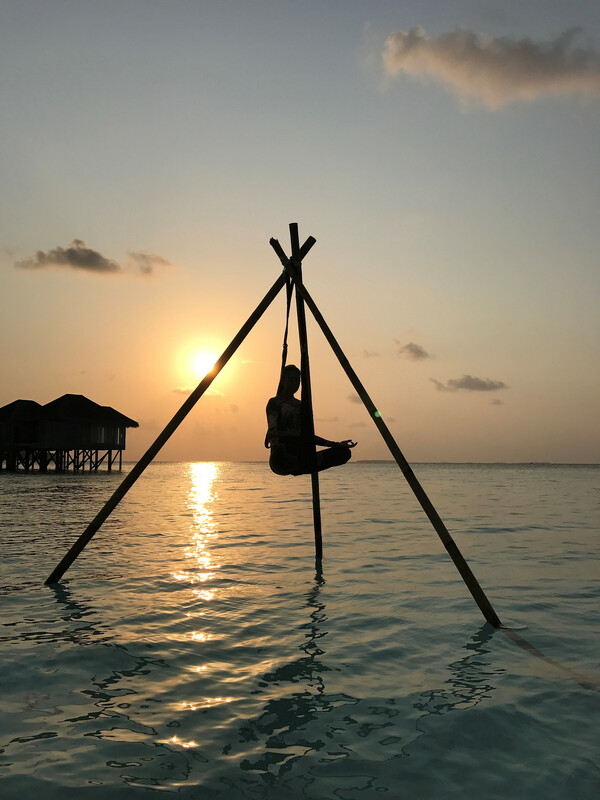 It has a series of activities in the Maldives, including over-water aerial yoga, beach meditation, surf lessons and ayurvedic spa treatments. 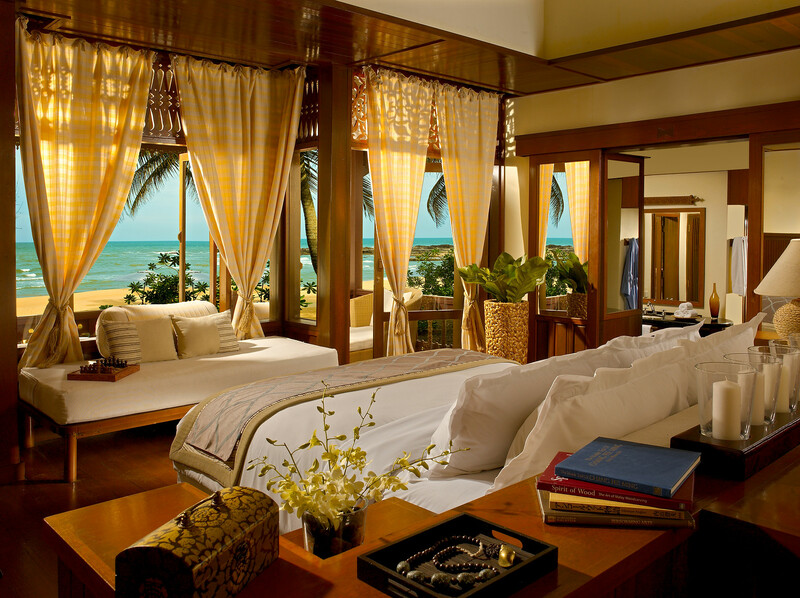 Using the sky, the sea and the beach, Anantara wants to improve their guest’s fitness regime and revitalise the body. Using safe yoga hammocks guests can be suspended a few feet above the water in the Maldives. Specifically, this takes place above the lagoon surrounding Anantara Kihavah Maldives Villas. 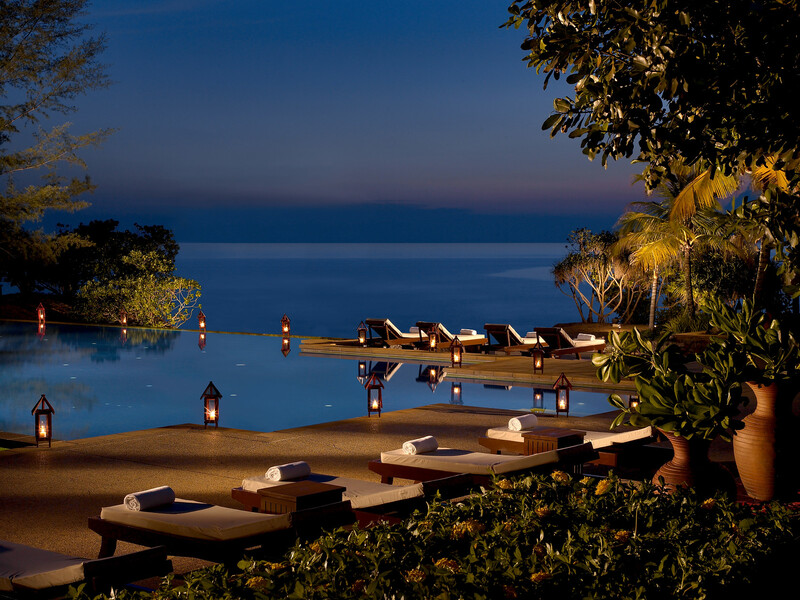 Combined with the sounds of the Indian Ocean, this provides an ideal setting. This type of yoga aims to combat fatigue and joint pain, as well as stimulating blood circulation, relieving back pain and strengthening the core. This is all with the help of experienced yoga specialists for both adults and children. This is provided at The Anantanr Surf School by Tropicsurf. 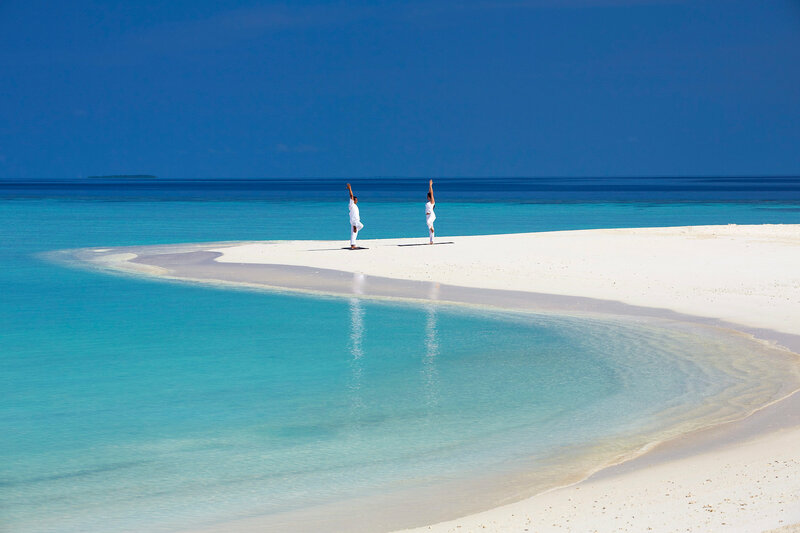 At the Anantara Dhigu Maldives Resort, guests can experience this at the same lagoon surrounding the resort. Learn the basics such as starting, stopping and turning with highly trained instructors. Stand up paddle boarding is perfect for improving core stability and leg strength to maintain balance. For the adrenaline junkies, the surfing should satisfy your needs. All abilities are catered for. These private lessons with qualified instructors take place again with Tropicsurf in 3 locations. The Anantara Dhigu Maldives Resort, Anantara Veli Maldives Resort and Naladhu Private Island Maldives are all surrounded by the waves of the Indian Ocean. Private Surfing Lessons start from USD 90 ++/£69 per hour, includes boat transportation (depending on location) and all equipment. Stand-up paddle board rental start from USD 60 ++/£46 for 2 hours. 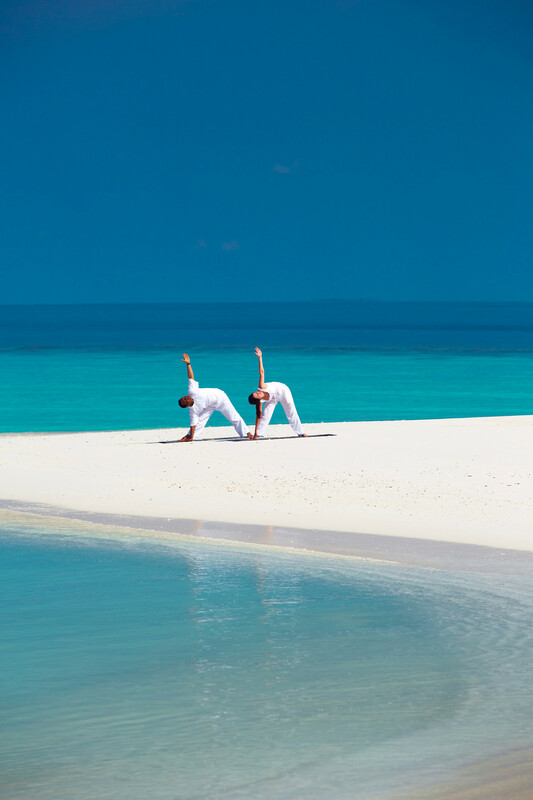 Meditation and yoga session are provided by Naladhu Private Island Resort on a private basis or in a group. These sessions are aimed at improving physical and mental balance. Let your mind escape the stress of daily life and embrace the Maldivian elements of lush tropical nature, soft powdery white sands, and translucent ocean, providing vivid inspiration as well as a natural healing environment. 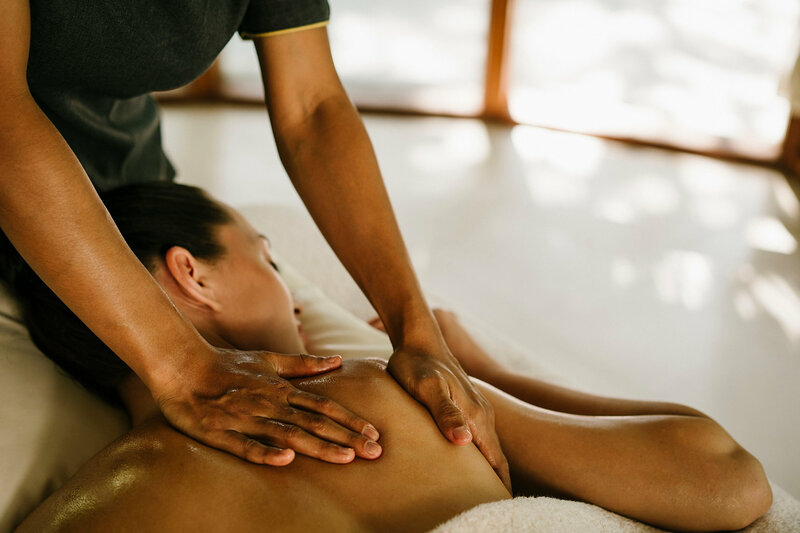 These treatments are offered by Anantara Kivahah Maldives Villas by an Ayurvedic specialist with Balance Wellness by Anantara. 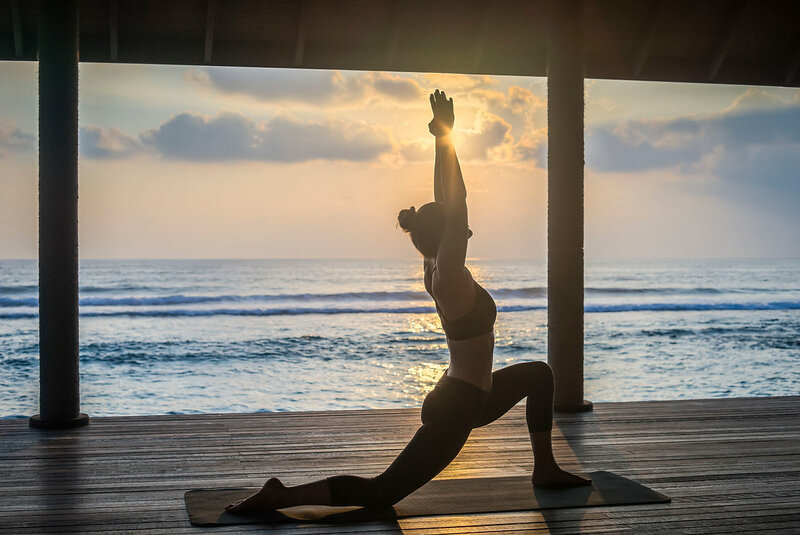 They offer a choice of sunrise or sunset yoga classes, daily breathing exercises, meditation, daily treatments, healthy meals and refreshments, access to herbal stream and one Ayurveda Lifestyle consultation. Following this, the Wellness Chef, Eric, can provide a delicious wellness menu catered to the guest’s needs. All in all you will feel refreshed, rejuvenated, confident and strong. 3 Day Retreat – USD 800 ++/£614. 5 Day Retreat – USD 1,500++/£1,151. 7 Day Retreat – USD 1,950++/£1,496. 5 Day Retreat – USD 1,650++/£1,266. 7 Day Retreat – USD 1,900++/£1,458. Nightly rates at Anantara Kihavah Maldives Villas start from £787 for a Beach Pool Villa for two adults and up to two children on a B&B basis. Nightly rates at Anantara Dhigu Maldives Resort start from £443 in a sunset beach villa on a B&B basis. Nightly rates at Naladhu start from £650 per night in an Ocean Pool Villa for two people and 1 child on a B&B basis. Nightly rates at Anantara Veli Maldives Resort start from £485 for an over water Bungalow on a B&B basis. If you’d like to book a Yoga classes at home or abroad, visit Wellclik.com. Interested in Running? Read Our Top 10 Mindset Hacks. If you’re taking up running or a marathon for the first time, we all know how daunting it can be. We want to be fitter straight away. However, don’t race to a negative conclusion immediately. You need to buy new gear, you’re worried about your fitness, if you’re a parent how will you squeeze it in with the kids? The main thing is to really focus on the positives and not let anything stand in your way. We’re here to take you through some of the main thoughts that can hinder progress and give some helpful advice on how to overcome these. From setting goals to tracking progress, we’ve got you covered. 1. Success is a very individual thing. You don’t need to start comparing yourself to others. Always focus on yourself. You should gain confidence by any progress you make. 2. When you get in from work, do not sit down. Change immediately and run. I have fallen victim to the snacking and TV watching as soon as I arrive home. Once you’re actually in your gear there’s a much smaller chance that you’ll think about skipping the run. If you can get into that habit then great. 3. If you’re having general motivation issues, join a running group or form your own. The additional motivation you get from not letting people down will be enough for some consistent training. If you’re taking it a bit more seriously, join your local club. There are some massive social gains you can get here also. 4. Set yourself a goal. Get some friends and book a race. There’s nothing better for motivation than knowing you’ve spent money on an event to test yourself so you obviously won’t waste it. You’ll be a lot more determined to see it through. 5. Some days you’ll mentally convince yourself you’re tired and you’ll slow yourself in the middle of a run. Again, I’m guilty but really try to push yourself. Think about the amazing feeling you’ll have when you arrive home after a big effort. 6. If you’re worried about your fitness or you’re lacking in confidence because of it, use my motto. If you’re out of breath, it’s working and you’re getting fitter. 7. If you’ve been out for a few runs and you have a slower one, don’t get down about it. You haven’t lost the fitness. This is honestly just a blip that won’t be there the next day. Maybe you forgot to eat lunch or eat before the run. Focus on the positives. At least you went out and did it. Everybody has bad days. Move on. 8. On the opposite side, if you blast out a new PB, make a big deal out of it. Feel great about it. This might happen a few times at the start. 9. If you’re getting frustrated that you haven’t broken a PB in a while, try not to. Look at your first times and see how far you’ve come. After a while, PB’s get harder to break but this happens to absolutely everybody. Your personal development is what you should be focused on. 10. 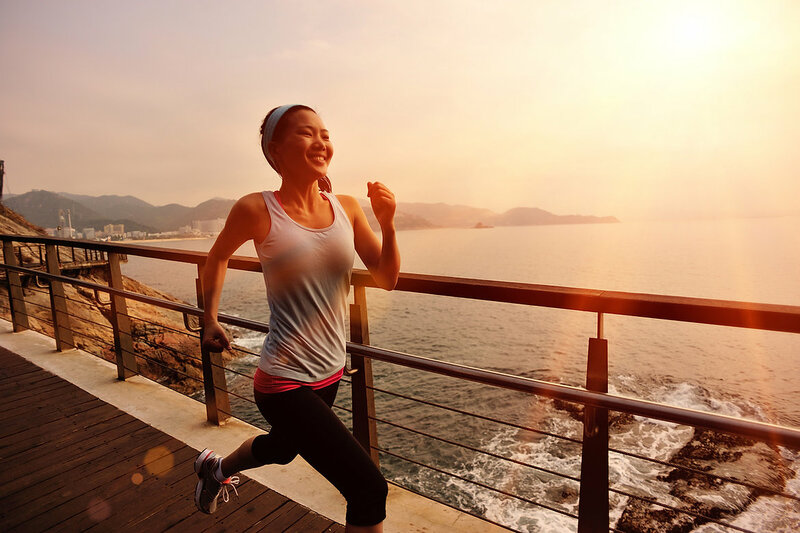 Become aware of the positive side effects that running has on your life. You’ll start to sleep better, lose weight and improve your mood. I go by the theory that the more hours I spend outside, the more I notice how much better I feel. I urge you to try it. 11. Don’t be impatient. Real results take time. 12. Really look forward to and enjoy your days off. Spend it outdoors as much as possible. You’ve earned it. If you have any running questions at all, don’t hesitate to contact us at Wellclik.com and we’ll do our best to answer them. This week I attended the Lynx Summer Series on South William Street. 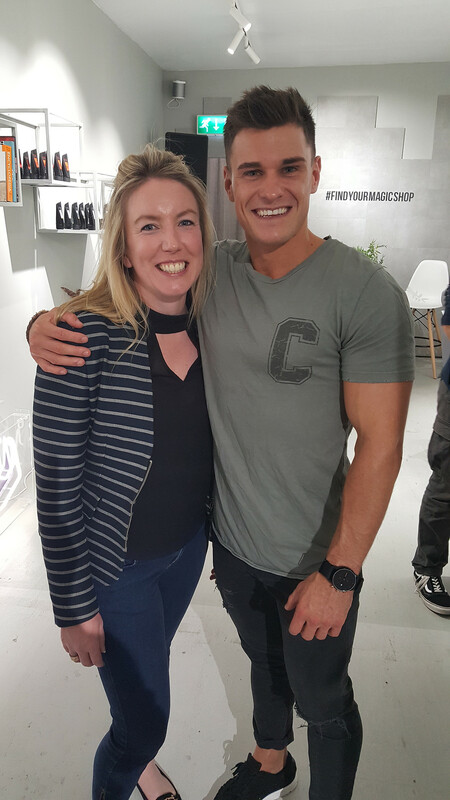 We managed to have a quick sit down with Rob Lipsett, star of Love Island and Personal Trainer to ask him a few questions about his lifestyle and his time on Love Island. Hi Rob thanks for talking to us. So why are we here with Lynx today? 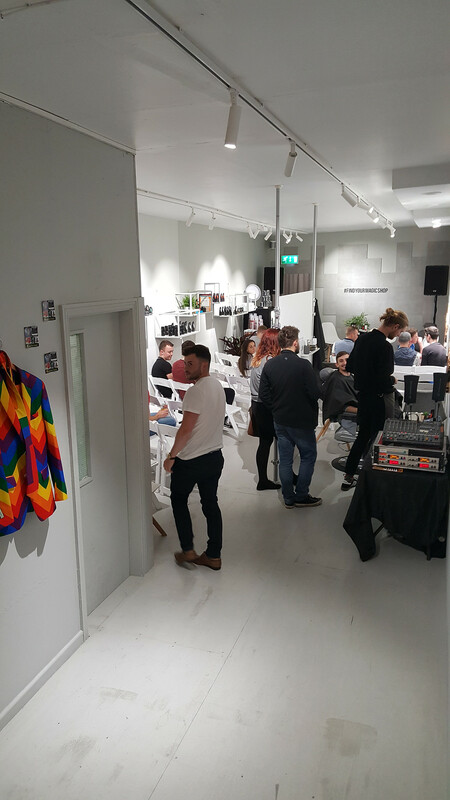 We’re here as part of the Lynx Summer Series to promote and celebrate men’s individuality and help them to ‘Find Their Magic’. There’s loads of cool things to do. You can check out how you’d look with some cool hairstyles with the magic mirror or take a visit to the fragrance area and try some. Do you ever take time out from training and what do you do to chill out? Oh 100%. I train an hour a day. So the other 23 hours I’m chilling. I’m sleeping. I’m working on my business. I’m editing or just going for a nice walk or hanging out with friends so yeah I try and relax as much as possible. What advice would you give to anyone trying to make it in this industry? Be true to yourself and work hard. And by work hard, I mean focus. Don’t spend 30 minutes looking at dog videos on YouTube. Cut out the Game of Thrones. Plus, it’s well documented that exercise helps you work and study harder so make time for that. Go out, have your 1 hour session and come back refreshed. Do you find there’s a lot of pressure in the industry and on yourself to create more and more content all the time and maybe find different ways of creating it? Yeah there is. You’re always having to level up. Years ago you’d be doing well to have a good camera. Nowadays you’ve gotta have a good videographer. You have to have the best editing. You gotta always be doing something. Always travelling, always making moves. I don’t see that as a bad thing. It’s not so much pressure. It’s just forcing you to level up. So that’s how I look at it. And in general do you find that there’s way too much pressure on men to keep fit and healthy? Well seeing as there is an obesity problem and more people are overweight nowadays, then no. The more people that move, the more people that go to the gym, the better. Also, if you even take a single better food choice, then that’s great. When you were in Love Island, what girl did you see yourself connecting with most? Well I think the one I fancied the most was Amber but she ended up winning it with her boyfriend. But when we went in, there were 6 new guys and 2 single girls. So it was like throwing a steak to a pack of dogs. What are your 5 favourite workout songs? The Lynx Summer Series continues with Al Porter on Thursday August 3rd & Paul Galvin on Thursday August 10th. 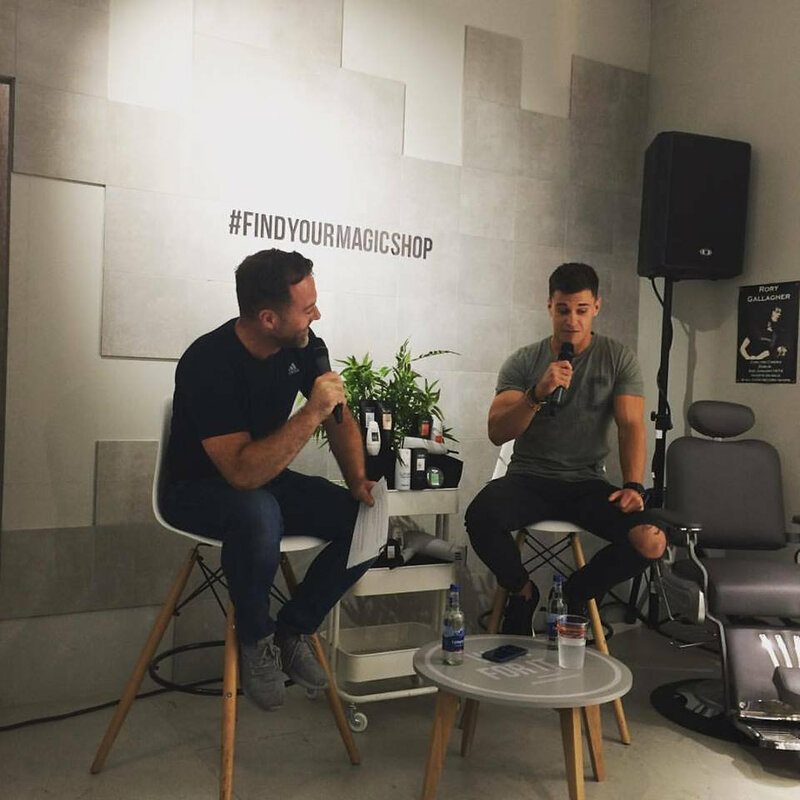 If you’d like to book an appointment with a personal trainer like Rob or you’d like to know more about nutrition and diet why not book an appointment with a practitioner in your area, via Wellclik.com? 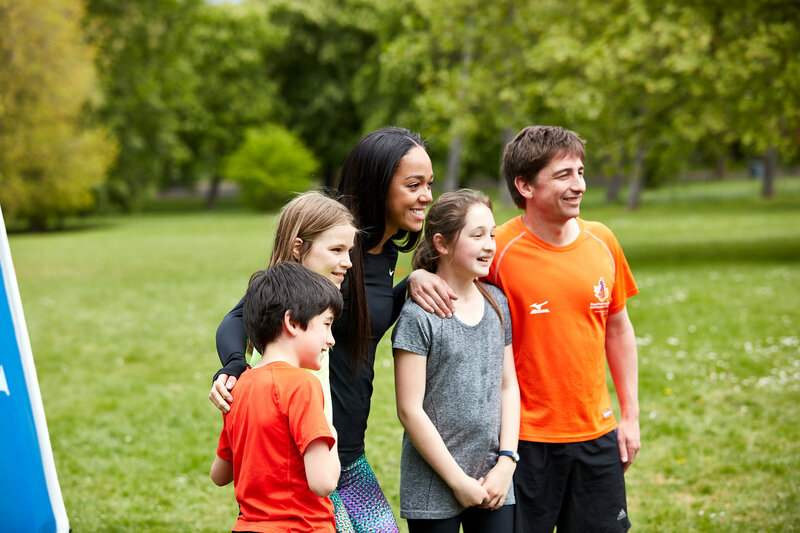 The GB team for the IAAF World Championships in London has just been announced this afternoon, and chief amongst the team is the formidable Heptathlete Katarina Johnson Thompson. She will perform in the High Jump and Heptathlon and fresh from performing a personal best at the Gotzi-Hypo meeting in May, she is on fire and ready for her place on the podium this time. I got the chance to catch up with her ahead of Championship season beginning thanks to BRITA UK. 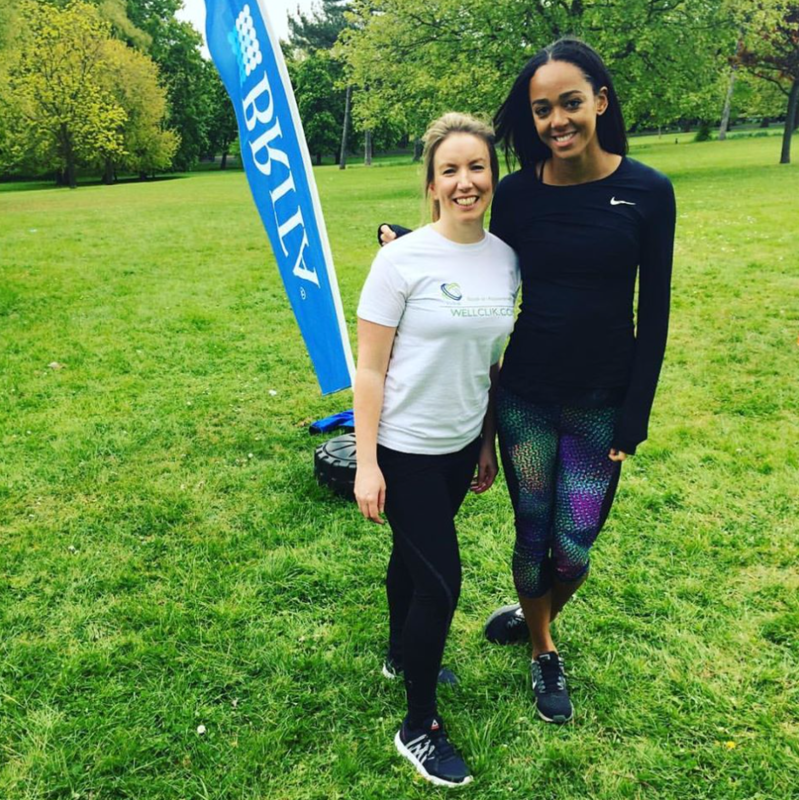 On a sleepy Saturday in London’s Finsbury Park she put me and a team of much fitter sports-nuts through our paces with the help of Rabble. 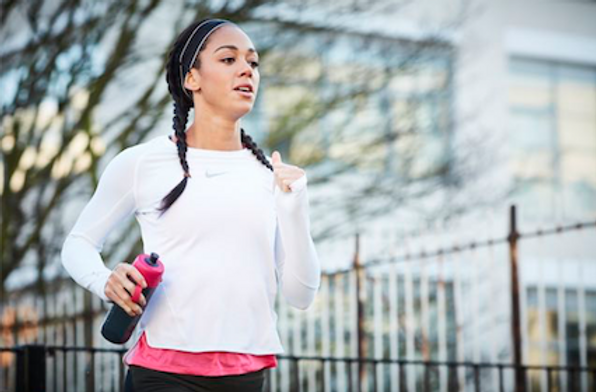 Katarina has put together a special training manual for Brita UK, Switch 7 – focusing on seven disciplines of power, strength, stamina and hydration. Brita recently launched their new Fill & Go bottle which includes a filter in every bottle helping you hydrate more efficiently during your workout. Recent research revealing that 68% of UK gym-goers feel their current routine doesn’t challenge them and are looking to switch it up. Most of us only attempt to switch up our fitness regime’s every three months whereas the body adapts to new workouts every two weeks, so bringing variety and choice into your workout is paramount. Katharina knows this more than anyone being a professional athlete, so i asked her what motivates her to workout most…. We’re here today for BRITA UK, what was the inspiration today for putting together the plan for the fitness tips? Do you use all the different exercises we’ve done today, like the hill runs and the resistance training? I was wondering, because you literally just did that back to back, didn’t you today? Yeah, it was ok, i just did a little work out there to help. I always find that exercises like that are easier when its with other people, like chasing other people so i tried to help out that way. All the elements are bits i use in training because i have a lot of events so i have to be good at all of them. So when you’re training do you always have other people around you? Today we all did it as a team. Would you always have other people to compete against or do you prefer to train by yourself? Yes, I’ve got training partners and i find it so much more helpful and its a lot easier and i also feel like you don’t slack off as much when there’s people around you. If someone just went on a jog and they started to feel tired, they’d stop, whereas with a group of people or a friend its a lot easier to get through it. You’ve also moved to France for training this year, have you found that a big change? Yes my life’s completely different in every respect! I live in France now. My training’s different, I train a lot more. My group are really different; I have a bigger group now and I train with them a lot. The weather is a lot different as well! How are you getting used to the language? The language is the most difficult thing for me, I find everything else seems to slide and fit in but the language it tough. Do you find that getting out of your comfort zone like that and moving away from what you’d been doing for a couple of years has really helped you? I feel like its helped me as a person, progressing in, just, life! I feel like in Liverpool i was just at home and i was used to my lifestyle but now i have to challenge myself. So you know, I’ve learned a lot about myself in different things i can so i’m happy that i’ve done it! One of our readers wanted to know most was how you overcome disappointment like when you set yourself goals and challenges and obviously there’s a lot of pressure on you as an athlete. How do you deal with that pressure? Yes, its very difficult. In life you have this certain mindset of how life’s going to be and sometimes that changes and its out of your control. So just basically going along with life being, ‘well that wasn’t meant for me, what can i do and whats within my control that i can change?’. So its all about figuring out what you can control and not worrying about the stuff you can’t? Thats an amazing tip for our readers! So whats next for you now? Its competition season now! i’ve done all the hard work so hopefully, fingers crossed the things i’ve changed work (laughing). Next week! Not my first Heptathlon, thats at the end of the month. So just little events up to the then. Well, well done, we’re all right behind you! After this interview, Katarina went on to score a personal best of 6691 points at the Gotzi-Hypo meeting in Austria. But due to the highly competitive athletes performing she just missed out on her spot on the podium. but as she says she only worries about what she can control now and I for one think she’s not even near to peaking in her ability to break records. Special thanks to Brita UK for organising our chat with Katarina.